There are some recipes that are a staple in our house. 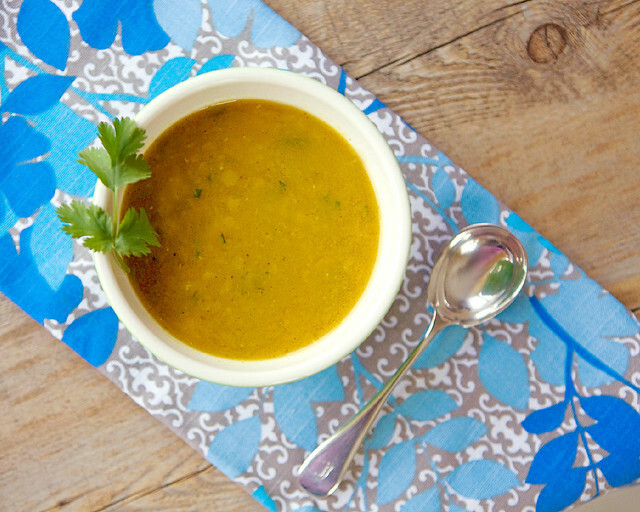 This vegetarian mulligatawny soup is one of them. I've been making this soup for a long time now, and I have no clue how I started making it in the first place. It could have been the damp, cold climate of England that may have kickstarted the idea for this warm and comforting soup. Or it could have been a desire to make a soup out of what is essentially an Indian dal. Whatever the origins of this soup, one thing that cannot be denied is that it's just utterly delicious, and unbelievably versatile. I have chucked vegetable odds and ends into this soup, along with beans or chickpeas. I have once, sneakily, thrown in some chicken when Kay was away, and I didn't want to bother with making full meals. Mulligatawny is an interesting dish, from the perspective of an Indian. Its almost akin to the other Anglo-Indian dish, Kedgeree, in its nature. There are quite a few theories as to its origin. The first one claims that its a British corruption of the Tamil words 'milagu-thani' or 'spicy water'. However, the problem with this theory is that the dish that is being referred could well be 'rasam', the broth like spicy condiment from the South of India. And a classic Western mulligatawny soup is very different from a rasam. This recipe has been trialled and has had a lot of errors remedied :-) I don't like my soups super spicy, unless they are Thai, so I milded this one down a bit. I also don't like using hot chilli powder, but I have included it in this recipe, as an option, if you like your Mulligatawny spicier. I do, however, very strongly urge you to make your own Madras curry powder and garam masala for this recipe. The difference in taste to store bought is something else, and as they are the primary flavours for this dish, the difference is really quite obvious. Its doesn't take long to make these spice mixes, and you can store them in an airtight tin in a dark place for up to six months. I also like to make it a little lighter by not using coconut milk, and to be honest, this soup doesn't really need it at all. Serve this soup with rice (oh, if you really prefer!!!) or with a chunk of crusty French bread, like I do (yeah, very Indian, right :-)) You could also do naans if you prefer, for a light lunch or a starter. I also like to squeeze over some lemon juice to taste, to really brighten up the spice flavours. Give it a good stir, before serving, as lentil soups sometimes tend to split a bit. Place the lentils in a pot, and cover with cold water. Bring to the boil, and boil hard for about 5 minutes, skimming off any scum that rises. Turn down the heat and cook for 15 - 30 minutes, until the lentils are soft, and falling apart, and the cooking water is almost absorbed. While the lentils are cooking, make the soup base. Heat the oil in a pot, and add the onions. Sweat them for a few minutes, until the raw smell disappears. Add the garlic and ginger, and fry for a minute. Add the Madras curry powder, ground cumin, garam masala and turmeric, and stir for a minute or two. Add the celery and carrots (if using) and saute for a few more minutes, so that the vegetables are coated with the spices. Add the hot stock to the pot, bring to the boil, then turn down the heat and simmer until the celery and carrots (if using) are soft, about 5 - 7 minutes. Take off the heat, and leave the soup base to cool down. When cool, blend to a fine puree, and return to the pot. Add the lentils to the soup base, and simmer for an additional 5 - 10 minutes, until the soup is thick and creamy. You can puree it again, if you wish, but it really doesn't matter, as the lentils add a slightly chunky texture to the soup. Taste and add some salt, if you think the soup needs it. Garnish with the fresh, chopped cilantro and squeeze over the lemon before serving. looks absolutely GREAT! i cannot wait to try this recipe. Love Mulligatawny but have never been able to make a good one at home yet. I've seen a lot of recipes that use apples which seems like a strange ingredient to me. Yours looks perfect...can't wait to give it a try! this soup sounds so delicious - I think red lentils are easier on the tummy that the French ones?! the photo is gorgeous - I want a bowl for dinner ! I love Mulligatawny soup in fact I have some in my refrigerator right now. I've never made it but want to so bad. My husband can't stand curry so I know I'd end up making a huge batch and not be able to finish it before it went bad. The ones I've had have apples, coconut milk and almonds in it. I love it. However, the ingredients in yours sounds quite flavorful. I may just have to try and make a batch big enough for just two. One for me one night and then for lunch the next day. First of all, I want to comliment your gorgeous blog and all those yummy recipes. I have to go through it later on. We always have red daal at home and I usualy make red daal with fish and curry rice but then I get easily boredof always the same dish. Your red dal soup will come very handy in my house. thansk for sharing! this sounds wonderful! 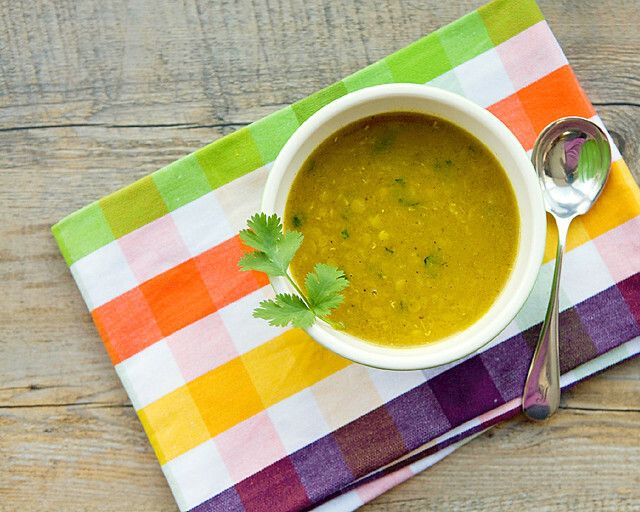 the lentil soup in my fridge already could benefit from the addition of some of your spices. thanks for the inspiration!! Thank you for posting this vegetarian soup recipe. This could be a great way to warm up on a chilly day. Since I need fibre in my diet I love to play around with lentils, beans and peas in my kitchen. Thank you for sharing the recipe. A healthy recipe to start the day. Love your photo. It's absolutely stunning! First, this soup looks amazing and looks so good!,, i must have to try this one! Thanks for this recipe. I subbed chickpeas as it's what I had and it's wonderful. Perfect for a chilly northern night. I made this soup last night and it's AMAZING! The flavors are spot on. It's smooth and creamy and I didn't have to adjust a thing. Even the squeeze of lemon at the end was a great added touch. Please continue to post. I can't tell you how much I love your recipes. Thank you! Yum! I tried this and it was yummm.. Could you please share more soup recipes with us? My kids are fond of soups and last night I tried Vegetarian Mulligatawny Soup with Red Lentils and hot & sour chicken soup and both were delicious.